We’re excited to publish a new Farmer Profile of an inspiring beginning farmer every few weeks on the NYFC blog to help showcase the breadth and vision of the next generation of agricultural leaders. This one is from Matt Hountz of Fork Right Farm in Indiana. Fork Right Farm is a multi-generational startup farm, founded in 2013, currently focusing on pasture raised pork. Involved in the operation are Matt and Sharlena Hountz and their two boys, Will age 2 and Keegan age 1. Also involved are Matt’s parents, Jim and Karen Hountz. For many years we have had large gardens supplying our families and friends with a variety of vegetables and produce. 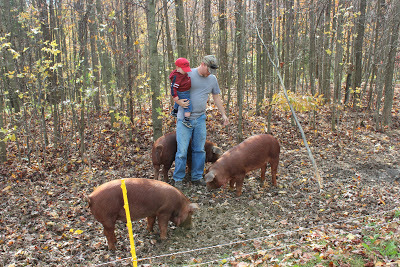 In 2013 Matt ventured into the world of feeder hogs and enjoyed raising 3 for our families. If we had raised 10 we could have sold them after word got out that we were successfully raising them on pasture. 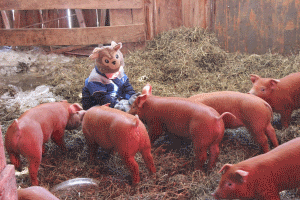 In the fall of 2013 we purchased our registered old-line Duroc breeding stock. We currently have 2 locations involved in the operation, one being the farm where Matt grew up and where Matt and his sisters were the 5th generation to live there. That property has been in the family nearly 100 years and next year will be eligible for the Hoosier Homestead Award given by the State of Indiana. We are excited to be re-starting the family farming tradition. The other location is Matt and Sharlena’s residence a few miles away where the former grain fields were planted with forage crops specifically selected for grazing hogs. Prior to purchasing the current herd our farming experience consisted of 10 years of 4-H for Matt, Sharlena was raised in a family that had primarily horses and cattle. Jim grew up in a family of 8 that produced many of their own foods in a time where it was more common to do so. Jim and Karen previously rented the pastures on their farm, while supporting Matt and his sisters in their 4-H efforts. Currently we have 3 unrelated sows and a boar as the foundation of our herd. 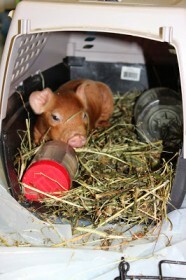 We are saving the best of our litters to grow our herd in coming years. From our litters born in our first winter we have 14 pigs, of which only a couple are left for sale at this writing, all others having been pre-sold. One to a customer from nearly 200 miles away! The breeding stock is provided a daily grain based ration, as well as unlimited hay and pasture. The feeder pigs are started on hay and the grain based ration while still young and learning to respect our electric fences. Once trained, they have unlimited pasture or hay seasonally, as well as access to the grain based ration. We utilize managed rotational grazing to insure that the pasture is adequately utilized, and to help control parasites naturally. We plan to grow our farm and business slowly. Adding to our breeding herd slowly over time and in the future will potentially expand into the production of other pastured meats. Be it poultry, beef, lamb or something we haven’t even thought of yet! At the end of all of our efforts we want to produce animals that we are proud to eat ourselves and sell to our family, friends and the community. Animals that have lived superior lives in a natural way. We want our customers to live the mantra “Know your farmers, know your food.” Everything we do is driven by the thought that someone we know now, or will know in the future will be eating our animals. We aren’t certified organic, or anything like that, it just costs too much at our current scale, but every decision we make is grounded in the best science and most natural methods possible. Our current marketing efforts are focused on word of mouth locally, as well as utilizing social media and a our farm blog located at blog.ForkRightFarm.com.